Sen. Susan Collins , R-Maine, departs after a vote at the U.S. Capitol in Washington, Feb. 17, 2017. Confirmation hearings for Gorsuch ended last Thursday on a tense note after Senate Minority Leader Chuck Schumer of New York vowed to block a vote on his confirmation, according to The Washington Post. “The Senate should resist the temptation to filibuster a Supreme Court nominee who is unquestionably qualified,” she said. Her call to avoid politicizing judicial nominees generally adheres to statements Collins made in early 2016, when Senate Republicans refused to hold hearings on former President Barack Obama’s nominee to replace the late Justice Antonin Scalia, Judge Merrick Garland. Collins urged Senate Republicans to “ follow the regular order” in considering the nomination of Garland, who sits on the U.S. Court of Appeals for the District of Columbia Circuit, and hold public hearings and either consent or withhold consent. “The only way that we can do that is by thoroughly vetting the nominee, and that means having personal meetings,” she told NPR in March 2016. She met Garland at her office in Washington in April 2016. Collins praised Gorsuch, who sits on the 10th Circuit Court of Appeals in Colorado, for his ability to separate his personal views on policy issues when he steps into the courtroom. Of the more than 2,700 opinions he has joined, he often sides with the majority, she said. “If it can be said that Judge Gorsuch would bring a philosophy to the Supreme Court, it would be his respect for the rule of law, and his belief that no one is above the law, including any President or any Senator,” she said. Collins previously met with Gorsuch at her office in Washington in February. 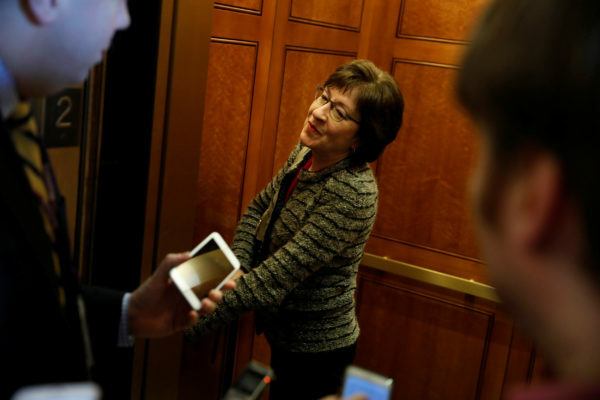 Her endorsement came on a day when progressive Maine advocacy groups scheduled demonstrations outside her offices in Maine in an effort to convince Collins to oppose Gorsuch’s nomination. McConnell said on Tuesday that the Senate would have a final vote on April 7 on Gorsuch, even as more Democrats opposed his confirmation. The Gorsuch nomination, McConnell told reporters, will hit the Senate floor next week after the Senate Judiciary Committee on Monday approves him. McConnell added that Gorsuch will be “confirmed on Friday” of next week. The confirmation of Gorsuch, 49, would restore the nine-seat court’s conservative majority, a major campaign promise for President Donald Trump.